The local property market is almost into its second year of an upward cycle and is being closely watched for signs of changes in its direction. While the outlook is still reasonably positive in the immediate future with demand and pricing still expected to hold out well, some industry observers are already factoring in the possibility that demand may start to turn soft next year. A number of research houses have downgraded the property sector and given it a “neutral” grade from the previous “overweight”. “Sentiment will turn slightly negative and we expect demand to start to soften possibly next year. It is appropriate to be watchful of property stocks as we are now almost two years into the upward cycle,” an analyst with a local research house says in a recent report. Property consultancy DTZ Nawawi Tie Leung Sdn Bhd executive director Brian Koh says the short-term expectation looks reasonably positive, especially if the Government’s Economic Transformation Programme (ETP) to promote a high income economy results in higher investments and new job creation. However, Koh does not discount that sentiment may turn soft if the highly expected “double dip” in the western countries materialises. “It will affect the country’s manufacturing and export sectors. Another factor that can dampen property sales is if there are further hikes in interest rates,” he adds. According to Knight Frank Research, in its latest Real Estate Highlights report, the property sector is anticipated to remain promising as the economy continues to maintain growth, albeit at a slower pace compared to 2010. “Proposed measures under the ETP are set to boost the residential markets of Greater Kuala Lumpur/Klang Valley alongside the government’s target to increase the population to 10 million by 2020,” it says. Projects in good locations, delivered by reputable developers with a good track record will continue to attract buyers. With several launches planned in second half of this year (2H2011), property developers are now focusing on quality construction and on-site services to drive the market forward. However, the high-end condominium sector looks set to retain a cautious outlook following a period of slower domestic economic growth, the imposition of a maximum loan-to-value ratio of 70% on third mortgages, and the recent announcement by Bank Negara on the overnight policy rate hike. CH William, Talhar & Wong Sdn Bhd (WTW) managing director Foo Gee Jen says the local property market is expected to ease slightly in the 2H2011 due to concerns that the economy will slow down while costs rise. Foo points out that concerns the economy will slow down in 2H2011 in light of rising crude oil prices might put pressure on inflation rates. “Coupled with the strengthening ringgit, manufacturing costs could be moving higher which would render the country’s export less competitive in the global marketplace,” he explains. On the construction front, he says inflation will lead to higher construction cost while the recent Bank Negara interest rate and SRR hikes are expected to constrict future housing credit expansion, and raise borrowing cost. “Collectively, these factors may result in a significant rise in the cost of house purchases and lead to a fall in demand for newly launched housing starts,” he adds. Foo says growing competition in the high-end residential market in the Klang Valley may result in a slight decline in sales take-up in secondary localities, although strong demand still persists for high-end landed residential properties in well sought after locations. “Projects in well-established localities with good connectivity and shopping, recreational and entertainment facilities, will continue to be in high demand. “However, those located in isolated enclaves such as Ulu Kelang are facing resistance in demand due to a lack of comprehensive facilities and concerns of deteriorating accessibility as traffic jams around Kuala Lumpur worsen,” he adds. Foo says prices of luxury condominiums will face strong downward pressure due to the large incoming future supply, adding that developers will attempt to maintain prices by improving their quality, layout design and lifestyle marketing concepts. 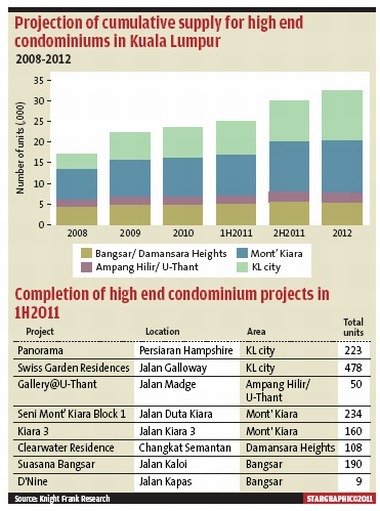 By the end of 2011, the number of luxury condominiums in Kuala Lumpur will further increase by 1,314 units. The total supply of condominiums in Kuala Lumpur as at the first half of this year stood at 86 developments offering 10,104 units. According to a recent report by WTW’s research department, the average occupancy rate of luxury condominiums in Kuala Lumpur in selected locations ranges from 60% to 75% in the first half of 2011 (1H2011). Luxury condominium prices in the city centre range from RM800 to RM1,300 per sq ft while in off-city centre locations such as Mont’ Kiara and Damansara Heights, they are from RM600 to RM1,000 per sq ft.
“Our random surveys continue to reveal that the purchasers of the developments are predominantly locals but the occupiers (in most cases as tenants) comprise a large population of expatriates,” the report adds. It also says the Klang Valley’s office market remains a tenant’s market with a large amount of space available for leasing. Landlords of newly completed buildings continue to offer two to three months rent-free periods as one of the sweeteners to attract new tenants. Newly constructed or refurbished office buildings are securing new lease at a much slower rate while there are also office buildings along Jalan Tun Razak which have remained largely untenanted for more than two years since their completion in 2008 and 2009. As at 1H2011, purpose-built office space in Kuala Lumpur’s central area (KLCA) accounted for 40.10 million sq ft. Approximately 5.975 million sq ft will be completed by end 2014, and of this about 4 million sq ft of space in nine buildings will be located in Kuala Lumpur’s golden triangle (GT). Over 3 million sq ft of the new office space will come onstream by end-2011. The average occupancy of office space in the GT was slightly below 90% in 1H2011, compared to 91%-93% in the last two years. Average rental and net yield of prime office space in the KLCA were in the range of RM6.50 per sq ft and 6.5% respectively. On the retail front, the WTW report points out that the retail sector continues to be resilient and vibrant with high occupancy levels in all the popular and established shopping malls. The latest retail centre to be opened was Viva Homes along Jalan Loke Yew. “The take-up rate was reported to be good and attracting a good volume of visitors and shoppers. Occupancy levels and rentals are expected to be maintained in 2H2011 as retail spending is expected to grow about 6% this year,” the report adds. As at 1H2011, there were 120 retail centre developments in the Klang Valley, totalling approximately 40.45 million sq ft, with no significant new future retail space supply in the KLCA. PUTRAJAYA: The moderately strong performance of the Malaysian economy, together with favourable demographics, income and employment growth, urbanisation and accommodative financing conditions will support continuing growth of the property market. RAM Holdings Bhd group chief economist Dr Yeah Kim Leng said Malaysia’s demographic structure was still a relatively young population, with a very low age dependency ratio and also high levels of rural-urban migration. 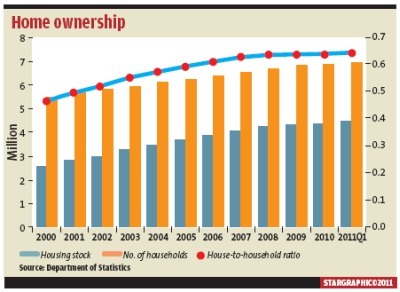 “Apart from that, as property becomes an important assets class with the rise in the household income, demand for properties especially the high-end will also continue to grow,” he said yesterday at the Malaysian Property Outlook 2011 conference. Yeah said the total value of residential and commercial property stocks in the country was projected to increase at 8% to 10% annually over the present decade (2011-2020) from an average of 5.9% per annum achieved in 2001-2009 period. However, Yeah said uncertainties over the next general election, the delayed of ETP implementation and inflation risks might somehow derail the growth of the property market. The conference was jointly organised by property developer Encorp Bhd and Malaysia University of Science and Technology. It was aim at providing an outlook on the economy and property market, as well as insights on current issues and developments within the property sector. The greatest challenge for shopping centres today is not about theme and concept, says Henry Butcher Retail managing director Tan Hai Hsin. Instead, it is about market saturation. “There are too many retail space chasing the same customers,” he says. Notwithinstanding that, developers continue to plan for shopping centres big and small throughout the country. “There is in general, an oversupply of retail space throughout the country,” he says. However, a high-density mixed-use development like 1 Mont’Kiara Mall (1MK) is viable in city centres. “It is viable in locations where there is already a presence of high-rise developments,” he says when asked to comment on malls in general and on 1MK, a neighbourhood mall. 1MK comprises a 20-storey office tower, a 34-storey block of office suites and a five-storey retail mall of 350,000 sq ft. Adjacent to the development are residential suites. Less than 1km away is Plaza Damas in Hartamas . Tan says malls which comprise different components, as in the case of 1MK, are conceptualised and built this way for a reason. “Developers need to build more components to justify the investment returns,” he says. The question is, will the additional components help neighbourhood malls to increase traffic? Speaking about projects which come with different components and not referring to 1MK specifically, Tan says the success of a mall does not depend solely on support from other components within the same development. If the shopping centre does not offer anything suitable for tenantswho work and live there, it can still fail. “Office workers and residents may still travel to other areas for food and grocery,” he says. This year alone, between 50 and 60 new shopping centres are being planned. With this in view, Tan says several scenarios will emerge in the next few years. “Many planned shopping centre projects will not get to start because the developers could not get bank financing to construct the buildings. Banks are very careful in lending money to developers who want to build shopping centres. “Second, developers who sell their retail lots in their shopping centres in order to finance their projects will see the shopping centres poorly occupied after opening. In a radio interview with BFM, Pavilion KL retail chief executive officer Joyce Yap said the retail mix of a mall is important. She said malls that have a third of its space allocated for food and beverage tend to do well. In the case of 1MK, this is exactly what mall owner Singapore-based ARA Asset Management Ltd has done. Its CEO (ARA private funds) and director (corporate office) Ng Beng Tiong says 40% of its retail space in 1MK has been allocated for food. Normally, as with other malls, the ratio is about a third or a fourth of its space allocated for food. Ng says the occupancy rate has been pretty good so far, and today occupancy stands at 70% although it has barely been six months in operation. Ng does not expect the weak US growth and the uncertainties in Europe to have much effect on its plans for 1MK. “We are looking for mid-market malls, not those in the high-end category, nor those in the lower end category. Mid-end, or those catering to a large middle-class group, tend to be resilient. Secondly, investors from Europe and the US want a bit of exposure here,” he says. ARA Asset Management is considering buying up to 10 neighbourhood malls in the country. ARA Asset Management is an affiliate of Hong Kong’s Cheung Kong Group, which is controlled by Hong Kong tycoon Li Ka-shing. CBRE Malaysia executive director Paul Khong also shares his views on malls. “Neighbourhood malls located within a highly populated area will continue to do well. The Mont’Kiara population is affluent enough. Food and beverage and groceries should do well,” he says. Khong says in the case of 1MK, although the take-up rate of the mall has been pretty good, it will take time for the mall to enjoy a good traffic flow as Mont’Kiara is not fully occupied. “Mont’Kiara, in terms of occupancy is at 50% . As more condominiums rise, the average occupancy rate will drop. The population in Mont’Kiara need to further grow for this place to do well,” he says. Khong says neighbourhood malls are not stand-alone malls, like Suria KLCC or Mid Valley Shopping Centre. Neighbourhood malls are there to cater for the daily need of the community they are located within. Seven developers from Penang and Kuala Lumpur are launching properties, comprising largely residential projects with over RM2.271bil gross sales value (GSV), for the island and Seberang Prai beginning the second half of 2011 and in 2012. Some 1,722 units of the properties with an RM1.899bil GSV are planned for the island, while the remaining 1,389 units with an RM372mil GSV are for Seberang Prai. Sunway City Bhd, Mah Sing Group Bhd, Lone Pine Group of Companies, Ivory Properties Group Bhd, MTT Properties and Development Sdn Bhd, Asas Dunia Bhd, and DNP Land Sdn Bhd are the developers with plans for new launches. In April 2011, IJM Land Bhd (RM413mil), Mah Sing (RM1.08bil), and SP Setia (RM615mil) had announced RM2.108bil worth of landed and high-rise properties for launching on the island. Sunway City is launching RM1.43bil worth of properties in the south-west district of the island. “This comprises 50 units of three-storey terraced houses, priced from around RM900,000 to RM1.1mil, with RM50mil GSV to be launched in September for the Sunway Cassia project. “Another 170 units of three-storey terraced and semi-detached properties with RM170mil GSV will be launched in early 2012 for the Sunway Cassia project. “We will launch around 600 units of landed properties and condominiums on an 81-acre site with RM1bil GSV in Sungai Ara in 2012,” Sunway City general manager Tan Hun Beng said. He spoke after the Star Property Fair 2011 Round-Table Dialogue held at the Star Northern Hub in Bayan Lepas, Penang, on July 5. The dialogue, moderated by Star Publications (M) Bhd regional manager (operations) Chung Chok Yin and Henry ButcherMalaysia(Penang) director Dr Teoh Poh Huat, is a prelude to the Star Property Fair 2011 that will be held from July 21 to 24 at G Hotel and Gurney Plaza. Mah Sing is launching the RM200mil South Plaza project, comprising 206 residential suites and 47 lifestyle retail lots, for its Southbay City scheme in Batu Maung this fourth quarter. Its northern region general manager Low Eng Hooi said construction work for the project would start in 2012. Lone Pine Group of Companies general manager Mabel Ooi said the group planned to launch over 100 three-storey semi-detached villas, with an approximate GSV of RM100mil, in Paya Terubong at the end of 2011. “In the first half of 2012, we will launch over 200 apartment units of RM100mil GSV in Paya Terubong,” she said. Ivory Properties Group Bhd deputy chairman Datuk Seri Nazir Ariff said the group would launch 220 condominium units and 20 shop lots for the RM168mil The Latitude project in Mount Erskine, Tanjung Tokong in the fourth quarter. MTT Properties and Development Sdn Bhd general manager Jason Tan said the company was launching its luxurious home scheme in Balik Pulau in the fourth quarter 2011. MTT group general manager Jason Tan said that the project, comprising 29 hillside 3-storey villas, had an RM87mil GSV. “Located in the group's Botanica. CT project, these will be the most expensive homes to be built in Balik Pulau, as each unit would be priced above RM3mil,” he said. “MTT is also targeting to launch 80 units of affordable town-houses with an RM24mil GSV for the Botanica. CT project in 2012, which would be priced around RM300,000 each,” Tan said. In Seberang Prai, Asas Dunia is launching some 1,253 terraced, semi-detached, low-cost town-house properties in central and south Seberang Prai with an RM292mil GSV from now till 2012. Meanwhile DNP Land Sdn Bhd general manager (North) K.C. Tan said the company would launch 136 semi-detached houses with an RM80mil GSV for the first phase of the Jesselton Hills project in Bukit Mertajam this third quarter. “The pricing of the units starts from RM550,000 onwards,” he said. Meanwhile, Chan, who is also the Real Estate Housing Developers' Association (Penang) chairman, said the price of landed properties in Seberang Prai was expected to grow by double digit in Seberang Prai. “On the island the rise of landed property prices would depend very much on the location, as they have already risen appreciably over the past one year. “Property buyers would adopt a more discerning approach towards investment in luxurious high-rise properties. “However, property prices in Penang would remain stable, due to the rising cost of land and building raw materials,” he said. On overseas investment into Penang's property, Chan said the foreign participation was still low, as some foreigners still prefer to rent due to low rentals. Henry Butcher Malaysia (Penang) director Dr Teoh Poh Huat said Penang was still not well known as an international destination for property investment. “Penang's appeal to foreign buyers has improved, as it is a city with vibrant commercial and lifestyle activities and rich heritage attractions,” he said. “However, on an annual basis, less than 5% of the property purchase in the country is taken up by foreigners. A lot of work needs to be done to rebrand and reposition Penang in the international market. IJM Land Bhd general manager (north) Toh Chin Leong said there was currently no bubble in Penang's property market due to the scarcity of land on the island. “This is why properties in prime locations are still in demand. Furthermore, local investors are still investing to hedge against inflation,” he added. At the roundt able are: (from left) Dr Teoh, Chan, IJM Properties’ Toh, SP Setia’s Rajoo and Sunway’s Tan. The Starregional operations manager (north) Chung Chok Yin and Henry ButcherMalaysia(Penang) Sdn Bhd director Dr Teoh Poh Huat recently met up with developers to ascertain the impact of a slower GDP forecast for 2011, rising interest rates, and escalating property prices amidst global challenges on the direction of the Penang property market. Chung and Teoh moderated The Star Property Fair 2011 Roundtable discussion held at the Star Northern Hubon July 5. The panellists included DNP Land Sdn Bhd (northern region) general manager K.C. Tan, IJM Properties Sdn Bhd general manager (north) Toh Chin Leong, Ivory Properties Group Bhd deputy chairman and executive director Datuk Seri Nazir Ariff,Lone PineGroup of Companies general manager Mabel Ooi, SP Setia Bhd (north) general manager S. Rajoo, Mah Sing Group Bhd general manager (northern region) Low Eng Hooi, Sunway City Bhd general manager Tan Hun Beng, and Real Estate Housing Developers' Association (Penang) chairman Datuk Jerry Chan. The roundtable talk was a prelude to the ninth Star Property Fair 2011 in Penang that will be held at Gurney Plaza and the adjoining G Hotel fromJuly 21 to July 24. The fair is organised byThe Starin collaboration with Henry ButcherMalaysia(Penang) Sdn Bhd. StarBizWeek: How do you perceive the property market outlook inPenangfor 2011 and next year? Chan: The outlook is stable. Landed properties with unique concepts will see appreciation. The demand is still there. It's just that people will be more discerning in their decision making when it comes to the high-end high rise developments. Nazir: Penang developers are now more organised. Nazir: That's going to be difficult. That is disturbing the market. How many foreign people own heritage properties now? Some might have foreign names but they may be locals. Toh: There is fear that if you don't buy property now, you can never afford it again in the future. The interest rate is increasing, and the price of oil, materials, land, and compliance costs are going up also. These are driving people to keep buying houses now. Low: Buyers expect different concepts, innovation and designs. All these factors will steer the property market and make it just as favourable if not more favourable than the outlook this year. SP Setia Bhd is riding high on the strong property market, given its vast landbank in high-growth property markets in the Klang Valley, Penang and Johor, and being a frontrunner for government land redevelopment projects. The property group has more than 3,500 acres of undeveloped land that will last it for the next 10 years. Three major projects planned for launch this year are the KL Eco City, which is located opposite the MidValley; Setia City in Setia Alam, Shah Alam; and Fulton Lane in Melbourne. They have a combined gross development value (GDV) of RM12.5bil. With Permodalan Nasional Bhd as its major shareholder holding a 32.9% stake and its expertise in both niche and township developments, SP Setia is in the forefront of government land redevelopment projects. SP Setia has been given the right to develop 40.22 acres of prime land in Bangsar in return for a new integrated health and research complex for the Health Ministry. The proposed complex, to be known as the 1National Institute of Health (1NIH) Complex, is to be developed on 55.33 acres owned by SP Setia's wholly-owned unit, Bandar Setia Alam Sdn Bhd, in Setia Alam, Selangor. The complex will house the various national health institutes and relevant supporting offices and research centres under the ministry's purview which are currently situated on 40.22 acres along Jalan Bangsar and other parts of Kuala Lumpur. In exchange, SP Setia will get the government land which it will redevelop into an integrated mixed residential and commercial project. It will provide the Health Ministry and the Government with a 20% share of the net profits from the redevelopment. Based on a conservative estimated plot ratio of five times and an efficiency factor of 70%, the net saleable area is about 6.1 million sq ft, and assuming an average selling price of RM1,000 per sq ft, the project's GDV will be about RM6.1bil, according to AmResearch in a note. “Compared to status quo, this land swap is accretive because the Bangsar site has high development potential and ready end-user demand. And, the relocation of the new research complex would accelerate the maturity of Setia City, the commercial precinct in Setia Alam,” the report says. But it says the deal falls short of consensus expectations, as SP Setia will only have a 50% stake, and the joint venture company will also have to distribute 20% of its profits to the Health Ministry. Given its established track record in township development, SP Setia can look forward to partaking in the development of the 3,300 acre-Rubber Research Institute land in Sungei Buloh. SP Setia has been invited by the master developer, the Employees Provident Fund's unit, Kwasa Land Sdn Bhd, to submit its input for the development of the RRI land into a mixed property development with focus on affordable housing. The RRI land development, which is estimated at RM10bil, is earmarked to be the new hub of the Klang Valley. Another project on SP Setia's plate is the urban renewal project for Cheras and Bandar Tun Razak, valued at RM2.8bil. It has recently been picked for the redevelopment of the ageing Seri Johor, Seri Pulau Pinang and Seri Melaka low-cost apartments and the Taman Ikan Emas low-cost homes in Bandar Tun Razak, Cheras. The project is part of the Government's urban renewal programme to inject life into decaying and ageing townwhips and slum areas in the federal capital. The project undertaken by the Federal Territories and Urban Wellbeing Ministry and City Hall will see many old low-cost housing projects in the city being redeveloped to provide the urban poor better living conditions. SP Setia can look forward to raking in record sales of RM3bil for the current financial year ending Oct 31, given maiden contributions from the prolific KL Eco City. A recent note by Hwang DBS Vickers Research says SP Setia will be one of the biggest beneficiaries of the mass rapid transit project with 25% of revised net asset value (RNAV), like the KL Eco-City and Jalan Bangsar (near KL Sentral), exposed to potential interchanges. SP Setia has been in the forefront in landbanking with four acquisitions worth RM15bil in GDV year-to-date. There could be more landbanking on the cards given its strong balance sheet. For the second quarter ended April 30, sales hit an all-time high of RM671mil, while cumulative six-months sales amounted to RM1.41bil. SP Setia said the result was the strongest ever, overtaking the previous highs achieved in the 2Q of financial year ended Oct 31, 2010, and six-months FY09 by 12% and 17% respectively. Net profit for the first-half of FY11 rose 72.53% to RM154.26mil from RM89.41mil in the previous corresponding period. Among the projects that contributed to the sales included Setia Alam and Setia Eco Park in Shah Alam, SetiaWalk in Pusat Bandar Puchong, Setia Sky Residences in Jalan Tun Razak, Bukit Indah, Setia Indah, Setia Tropika and Setia Eco Gardens in Johor Baru, Setia Pearl Island and Setia Vista in Penang. SP Setia president and chief executive officer Tan Sri Liew Kee Sin is confident the group will meet its FY11 sales target of RM3bil based on the strong sales momentum for existing projects and the upcoming KL Eco City project in Abdullah Hukum. It is obtaining the necessary approvals in preparation for the launch of its recently secured landbank that include a 268-acre land in Cyberjaya and another two parcels measuring 259 acres and 262 acres respectively in the fast-growing Tebrau Corridor, Johor. KUALA LUMPUR: Mah Sing Group Bhd was named as "The Best of Asia" at the seventh Corporate Governance Asia Recognition Awards 2011 while its group managing director Tan Sri Leong Hoy Kum won the "Asian Corporate Director Recognition Award 2011". "We place high priority in ensuring good governance in all areas of our operations, with appropriate control in place to ensure satisfactory levels of accountability and integrity, and we are honoured by these awards," Leong said in a statement yesterday. "The Best of Asia" Corporate Governance Asia Recognition Awards are presented to top organisations in China, Hong Kong, India, Indonesia, Malaysia, South Korea, the Philippines, Singapore, Taiwan and Thailand. Among the winning criteria include a publicly-acclaimed track record for corporate governance, disclosure, transparency and investors relations practices. Although the world is growing smaller and converging into a big global village with the rapid advancement of technology and science, the paradox is that instead of life becoming simpler, things are actually growing more complex and complicated. Rightly speaking, scientific and technological advancement should simplify things for the human race, but the opposite seems to be true. We are now saddled with more gadgets and tools that can complicate things if we are not careful. The advent of the Internet, personal computer (PC) and tacky devices like the iPod and iPad, is revolutionising the way people communicate with each other, and these inventions are fast becoming tools that people can't do without. Staying connected has taken a hold on the young and old alike, and it has been made easier through social networking sites such as Facebook and Twitter. Of course, the prowess of the Internet has its advantages that include faster speed of communication at lower cost and the ability to share huge chunks of information. Instead of having to build buildings, even teaching and learning can be conducted online through virtual e-classes and programmes. Students and lecturers can be thousands of miles apart but they are brought together in these e-classes. The Internet is also a superb business tool that has greatly lowered the cost of doing business. Many e-businesses that do not need shop fronts (such as consultancy and even some merchandise trading) have taken off successfully, and its full potential is yet to be reaped. But there are also the downsides brought on by the Internet and social networking sites that we need to be wary of. One of the most vulnerable groups is the young, especially children, who can easily fall prey to and be too trusting of what they see and read over the Internet. Many youngsters have become overly attached to their computer, blackberry, and lately the iPod and iPad be it to play computer games or to chat on-line. As a result, there are now special clinics to rehabilitate or cure these people of their addiction. This goes to show the computer addiction problem is becoming quite prevalent. Even the adults are not spared and it has been reported that many have become addicted to social networking sites to the extent that it hampers their performance at work. As a result, some employers have barred these sites to prevent misuse. Once a safe haven, the home has somehow been “intruded” by the presence of prying cameras and listening devices attached to the PC. I read in a recent report that these social networking sites are one of the biggest spy machines that have invaded our homes today. While these “invisible visitors” may not be physically present in our houses, they are omnipresent and are able to see what's going on around the house if the logged on computer and camera are unwisely left on. It is necessary to remind all the family members to be wary of who they befriend and chat with online, as they may be too trusting and believe everything they are told or read on the cyber realm. They should be reminded that the physical and cyber realms are actually two different worlds, and that they should be aware of the risk of talking to strangers in cyber space. This is because there are people who have no qualms about assuming false identities with the intention to mislead or cheat others. There have been quite a number of cases of people, especially young girls, who have gone missing and could still not be traced after befriending people on these social websites. One of the ways to prevent misuse of the computer is to have a common area for the home PCs where the elders can watch over the younger ones when they are logged on and there must be an agreed time frame for online chats or games. Regular interaction among family members to find out what each other is up to will also prevent over dependence on “cyber friends”. Reminiscing about the pre-Internet days, I believe life was much simpler when we (those born in the baby boomergeneration) were younger. For example, for recreation, we had very limited choices it was either playing masak-masak, heading off to Gurney Drive or Batu Ferringhi beaches (for Penangites) for a picnic or swim, watching a movie in the cinema or studying at home or in the library. The television set was still in black and white, and the personal computer had not yet made its presence felt. It was still an expensive gadget and not easily available. Life was certainly simpler with less distractions, and I'm sure our parents had a much easier time despite having a larger brood to care for. These days, although most families opt to have fewer children, it does not mean life has become simpler. Of course, the growing materialism and consumerism in the world today may have contributed to the insatiable greed among some sections of the populace, as the list of their “wants” grows longer. So is it a wonder things have become more complicated? Deputy news editor Angie Ng likes these words of wisdom from Chief Seattle: Man did not weave the web of life, he is merely a strand in it. Whatever he does to the web, he does to himself. KUALA LUMPUR: Although the actual cost of the country’s first mass rapid transit (MRT) system will be disclosed in September due to a 50% reduction in land acquisition and other tweaks to the initial alignment, estimates have put the price tag for the first of three lines at around RM20bil. Land Public Transport Commission (SPAD) CEO Mohd Nur Kamal said more time was needed to finalise the cost as the revised alignment was only recently approved given the changes to accommodate public feedback. “We have done a lot of changes as we are responsive to public feedback and are looking at August or September to nail down the actual cost,” he told reporters after the launching of the MRT, dubbed My Rapid Transit, which was officiated by Prime Minister Datuk Seri Najib Tun Razak yesterday. The launch revealed the final alignment of the 51km Sungai Buloh-Kajang MRT line, of which 9.5km will be underground. The line will have 31 stations. The final alignment not only reduced land acquisition cost, has led to better integration with existing rail network and reduced the number of stations but has become more cost effective than the initial alignment. A SPAD official said the new alignment would run across 70% of road reserve land. The remaining 30% of the line will traverse private land which will be acquired to build the tracks. “The tweaking of the alignment concentrates mainly on Taman Tun Dr Ismail, Bukit Bintang, Cheras and Kajang,” said the official. An analyst familiar with the matter estimated the cost of the first MRT line could be around RM20bil. “And the cost of the underground works may be RM7bil to RM8bil,” he said. The MRT’s project delivery partner (PDP), MMC-Gamuda Joint Venture Sdn Bhd, in which Gamuda Bhd and MMC Corp Bhd hold equal shareholdings, will be responsible for managing the project and its cost. The analyst that was present at the event was also surprised that the remaining two lines were still under study. The initial joint-proposal by MMC-Gamuda called for three MRT lines, including one circle line to be built at a then price tag of RM36.6bil. “We need to see the whole picture and integration. But, the cost of the three lines that was quoted in 2009, could have ballooned up to a total of RM50bil by now, considering the increase in construction raw material prices,” he said. It was reported the Government might plan to sell as much as RM30bil Islamic bonds under a programme to help finance the MRT. A special financing vehicle would be formed by the Government to raise the funds which would be used for the country’s biggest infrastructure project to date. Meanwhile, Najib foresaw that the MRT would improve existing real estate value and should be a catalyst to new property development adjacent to the MRT line. “It is estimated that new real estate development along the line could reach as much as RM15bil to be completed in a decade. “Additionally, gross national income (GNI) of about RM3bil is expected to be churned out based on the 20% increase in gross real estate value in terms of commercial and residential property in the 1.2 million sq ft of area in the radius of 0.5km to 1km from the MRT line in 10 years time,” he said in his speech at the launching. Residential and commercial property earmarked for development along the MRT lines are located in Cochrane, Rubber Research Institute land in Sungai Buloh, Menara Warisan as well as Bandar Malaysia Sg Besi. Also, Najib added that the GNI derived from the construction works of the MRT was expected to be RM3bil to RM4bil annually starting from this year to 2020.